Agricultural activities at Valhalla will be characterized by what are known as intensive gardening techniques. These include but are not limited to the following: raised bed gardens, composting, worm farming, bee keeping, soil enhancement, and season-extending devices such as hoop houses and greenhouses. The objective of combining these techniques is simple: produce the maximum quantity of high-quality vegetables, fruits, and herbs from the smallest space possible with minimum use of labor or machinery. Intensive gardening is an old practice. Asian and European societies with severely limited land resources have used similar techniques for centuries. The modern American model of huge farms with concomitant demand on machinery, chemicals, and labor reflect the natural response of settlers to a seemingly limitless amount of available agricultural space. While large-scale agriculture has proven highly productive, such practices are not the most useful or practical for a facility like Valhalla that focuses on productivity along with teaching skill sets that will most benefit the Soldier-residents in future endeavors. We start with the premise that wherever we locate in the Ozarks we will have lousy soil. That's why you don't find mega-farms in the Ozarks. So what can we do to 1) improve the soil, 2) create sustainable production levels, and 3) teach skills that have universal applicability? The answer to all these challenges is intensive gardening. Let's look at them one by one. Soil is going to be rocky and thin. We must literally create the bed in which plants will prosper. In order to do this we will build up, above the ground in raised beds approximately 12" to 16" high, confined by blocks, rocks, or wood frames. Each bed will be 4' wide so that a person can easily reach in from the side without having to walk on the soil. Once in place the soil will never be compressed by walking or machinery. 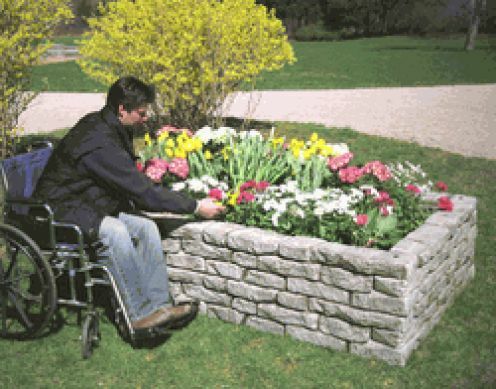 Some beds will be higher so that wheel-chair confined Soldier-residents can avail themselves of the pleasure and satisfaction of raising plants. The soil itself - the most essential element in intensive gardening - will be added to and improved over time, while being monitored regularly by simple testing kits for pH (acidity vs alkalinity), nutritive content, and friability. Initial tests will determine what elements need to be added, but in essence a mixture of topsoil (that may have to be purchased and trucked in), lime, compost, and additives such as peat moss and green sand. Biochar, as we mentioned in another entry here, will be a key component to the mix. Meanwhile composting will be initiated for all waste vegetation and animal manure produced. At the beginning we may need to beg or buy waste bedding from local horse stables or chicken farms to jump-start the effort. In time, with addition of livestock, we ought to be able to produce sufficient quantities to keep the garden happy. Once we locate the beds, excavate up to a foot of soil and remove it and replace it with our own mixture, then planting will begin. Seedlings will be started indoors from seeds to reduce costs of purchasing plants and to make sure that we have healthy, disease-free seedlings. Use of plastic hoop houses to extend both sides of the growing season (about 180 days) will afford the opportunity to plant before final frost and harvest past first fall frost dates. Some beds will be dedicated to long-lived species like asparagus and perennial herbs or to the garden "thugs" like horseradish and rhubarb that are invasive and take over weaker plants. Others will be planted on a rotational schedule, season to season, in order to take advantage of maximum growing capacity of the soil and reduce pest damage. 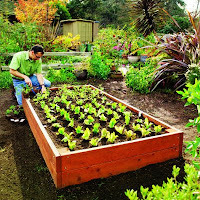 Raised beds lend themselves well to use of trellis and vertical growing techniques, another way to get increased productivity from limited space. While the actual garden is getting up and running, we will add beneficial synergistic critters such as worms (useful in breaking down manure and rough soil into humus), fowl, and bees. Honeybees have been hit hard recently and many wild hives wiped out. By maintaining our own hives we will boost pollination by as much as 30% and have supplies of honey, wax, and comb to boot. wire of a protected raised bed vegetable garden. 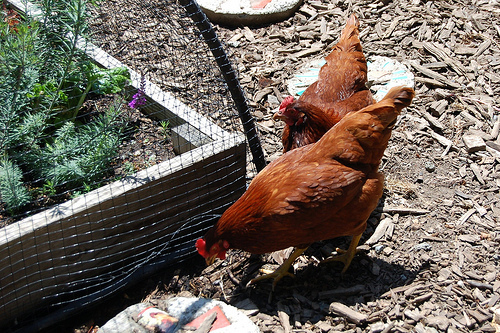 Once plants are up and growing we will use natural insect and slug control agents - chickens, ducks, and geese - to conduct daily foot patrols throughout the garden and eliminate (with extreme prejudice) invasive insect pests and new weeds. Judicious use of these multiple techniques - good soil, strong seedlings, and natural pest control - ought to reduce the need (and expense) of constant additives of insecticides and chemical enhancements. We are not organic gardening co-religionists, but will happily take the best of the techniques and use them to produce the highest nutritional value, best tasting produce possible. One positive aspect of the Arkansas Ozark region is that annual precipitation levels are at 40" - 45" with a lot of natural water sources, meaning that when combined with our rainwater harvesting practices we ought not have to worry about the brief summer drought periods. We plan to start small, with raised beds placed in fences, protected spaces to discourage natural animal pests like deer, raccoon, possum, and rabbits. In time we expect to convert larger areas to boost productivity (necessary to support an expanding population and to have enough to store for winter use). We will still use the raised bed techniques, but the area will be larger and will accommodate movable greenhouses that will provide exponential growth and harvest potential. When we combine intensive gardening, rainwater harvesting, and the synergy of livestock and composting, we will be training Soldier-residents on some excellent skills that they can use themselves or utilize as landscape-garden-small farm consultants. We also have a lot of appeal to potential donors who stress sustainable living, environmentally friendly, and light-footprint in their corporate or foundation missions. The exciting thing about these techniques is that they are all out there, tried-and-tested, and have proven extremely valuable. No wheel-inventing is needed to make this work. I began experimenting with intensive gardening in Northern Virginia when I was at the Pentagon and State, and picked it up again on a larger scale when I had my alpaca/llama farm in the Catskills. The potential is huge. Garden produce will be larger in volume and quality than with other methods and residents will learn useful skills. A win-win outcome for all concerned. If you want to read more about these ideas I suggest "Square Foot Gardening," by Mel Bartholomew and "Cubed Foot Gardening," by Christopher Bird (a retired USAF LTC living in the Shenandoah who has grown stuff all over the world including west Texas that he describes as "gardening in Hell").